Stuart Brown with his prize for winning the PGA Order of Merit event at Bentley. Photo: Tony Rushmer. Orton Meadows golf professional Stuart Brown clinched victory in a PGA Order of Merit thriller at Bentley GC yesterday (June 22), thanks to a superb birdie two at the SEVENTH play-off hole to finally shake off Chase Davis. 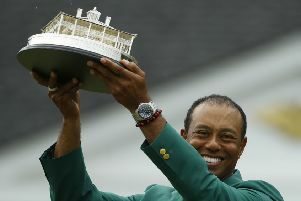 Brown, 42, struck a majestic six iron to eight feet before rolling in the putt on the 17th green to secure the third PGA Order of Merit victory of his career. But that doesn’t begin to tell the story of a dramatic finale to two superb days’ golf at the magnificently prepared Essex venue. But Portelli made a bogey at the 17th before enduring a horror finish to his round. He fired his tee-shot out of bounds on the 18th hole, only to reload and put himself into almost as much trouble. He eventually made an eight on the closing par four to finish at three-under-par. Steve Harris was already in the clubhouse on one better after a closing 68. In front of a packed clubhouse, it was all to play for as the final group of Scade, Brown and Davis approached the final green. Scade appeared to be in prime position – leading on five-under. But he was unable to get up and down from the back of the green and had to settle for a play-off spot. Davis two-putted from mid-range to tie the clubhouse lead, while Brown curled home a 22-footer for birdie on the final green to force his way into the play-off. Harris dropped away at the first extra hole – the par five 10th – but the other three all made birdie. Davis appeared to have one hand on the trophy when he chipped in for birdie from just in front of the green at the next, especially when Scade’s 30-footer could only burn the edge of the cup. But Brown stood tall to sink a downhiller from 15 foot for his own birdie and the play-off was down to two men. The extraordinarily high standard continued at the next as the pair again played the 10th in one-under the card. Neither man backed off as the extra time continued. But finally it was Brown who pulled off a masterstroke, hitting a peerless 200-yard iron shot on the 17th to within a few feet from where he would make his fifth birdie in seven play-off holes. It was a welcome and timely reversal of fortune on a hole that had caused Brown all sorts of problems in regulation play during the tournament. Brown said: “I’d played 17 in three-over for the two days – a double bogey on the first day and a bogey in the second round. So I was trying to claw them back to the 10th tee and take my chances there, rather than 17! “I didn’t have positive vibes but maybe the holes just level themselves out. Chase hit a nice shot into 15 feet, but I took dead aim and pulled the trigger to eight feet. The putt was just outside the left edge and in it went. The Order of Merit series takes a break now and returns in September with a double-header at Bishop’s Stortford and then The Rayleigh Club. Bentley Order of Merit (PGA in England East) leading scores: 140: S Brown (Thorpe Wood) 68 72 (won at 7th play-off hole), S Harris (The Shire) 72 68, C Davis (Marriott Sprowston Manor Hotel) 68 72, J Scade (Little Channels Golf centre) 67 73. 141: R Coles (Maylands G&CC) 71 70, G Portelli (Old Fold Manor) 69 72, B Kerr (Bourn Golf and Leisure) 69 72. 142: I Campbell (Cheshunt Park).